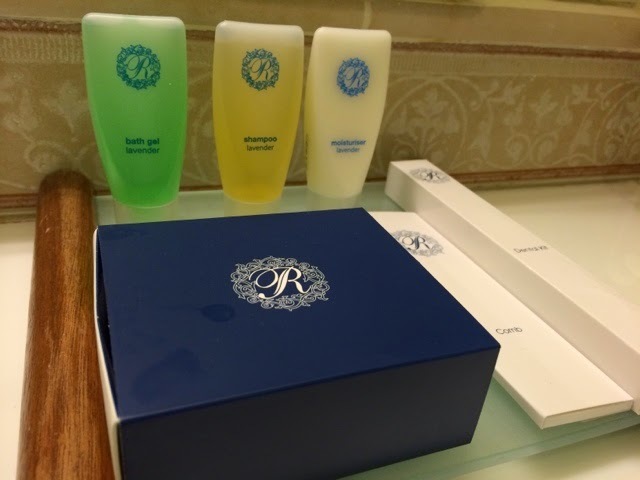 Last September, I went on a business trip to KL and had the opportunity to stay at The Royale Chulan Damansara. This hotel is not to be mistaken with The Royale Bintang @ Curve, although they belong under the same group and are within walking distance. Nevertheless, even taxi drivers get confused as there is also another Royale Chulan in central KL so if you are heading to the one in Damansara, please mention the location to avoid the mix-up. I had a horrible start with the hotel simply because they couldn't locate my booking (which was done by my department's secretary). 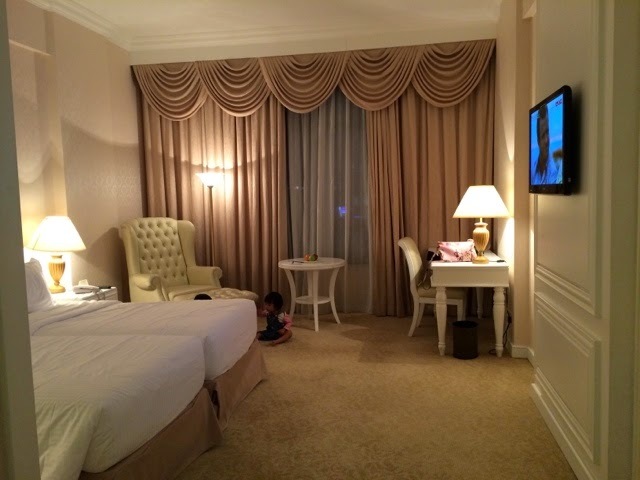 Since the trip coincided with school holiday, all rooms were booked in advance. I arrived at 2.30pm but had to wait until 6.30pm for any unclaimed reservation. I almost gave up but one of the female reception staff decided to let go one of the pre-booked room to me. Her initiative eventually made me change my mind about the whole experience, which initially I had decided to write a horrendous review of the management of reservations (apparently there were several guests who were informed that their reservation was not in the system). Anyway, I thanked the staff warmly and acknowledged them by their name, so they were nice enough to apologize for keeping me waiting. Due to the lack of choice, I was given a room at smoking floor. The room is admittedly gorgeous and elegant incorporating British boutique design, where the theme is classic white and beige. I simply love the draperies and the big white and studded armchair as well as the bed headboard. Much to our disappointment, the bathroom doesn't have a bathtub. 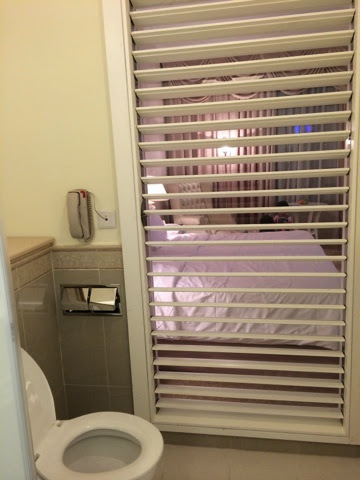 The toilet cubicle has frosted glass door, and the other wall actually had shutters if you ahem, want to watch tv while doing your business, I guess? 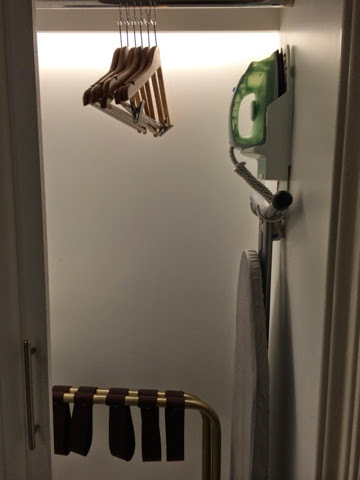 I get bothered up actually when hotels provide only one dental kit in the room meant for two, but maybe they expect guests to call to request for additional toothbrush. 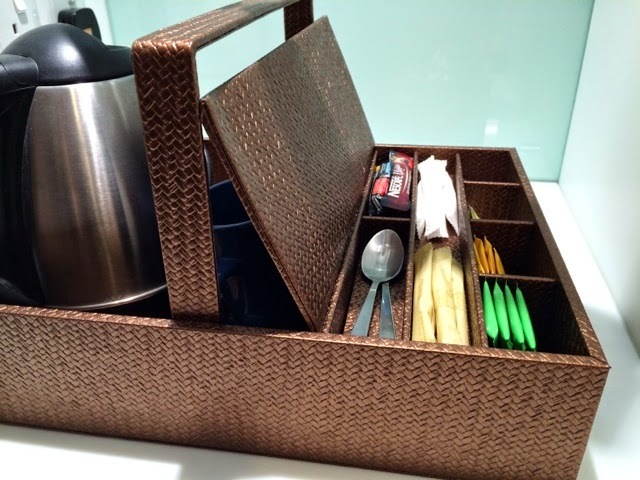 Tea making facilities with choices that are so... normal. 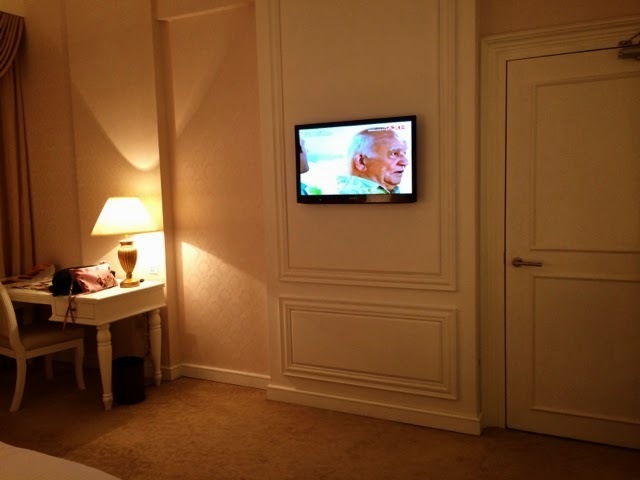 While I like that they have the LCD TV mounted on the wall (to save space), you have to have really good eyesight to watch the tv on the bed since the screen is quite small. The good thing about this hotel is it is a child-friendly hotel with spacious playroom (you have to pay to use this facility though) and even ice skating rink for the older kids and those young at heart. Other facilities include outdoor swimming pool, gym, spa and sauna, function rooms and restaurants (do check it out, because I think their food is nice). Overall, I wouldn't mind staying here again, due to its location (walking distance to The Curve, IKEA and IPC mall). Their cafe also serves good food and the room is pretty comfortable. 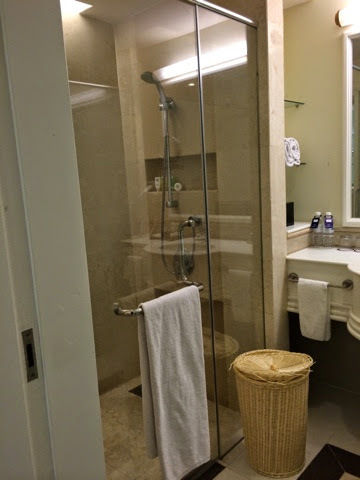 The rate is rather pricey though (RM300++) considering they don't even have a bath tub installed. 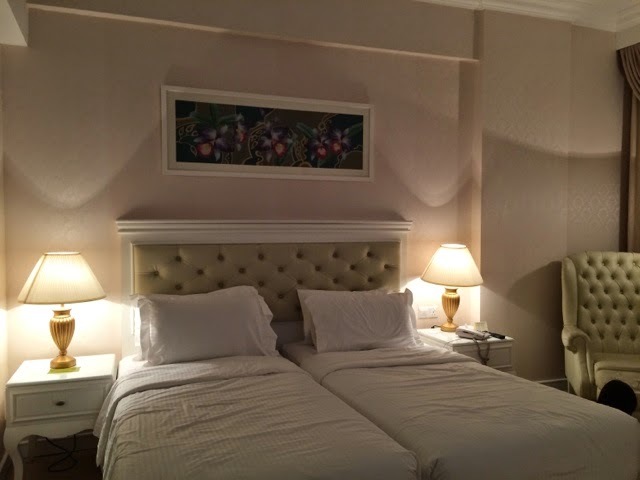 Make sure to double check and confirm your reservation prior to coming here since my colleague also mentioned that his reservation couldn't be found although he has email confirmation from the hotel. 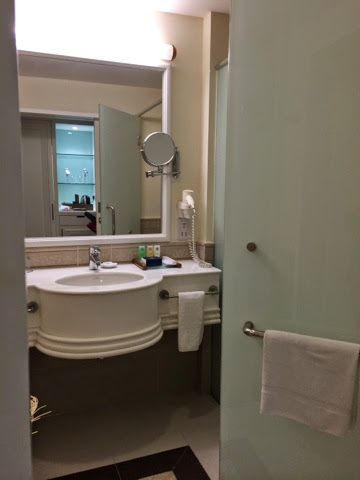 Sekarang ni memang design hotel macam open concept je kan. Tak kesah la nak guna toilet orang nampak pun. Kalau husband and wife ok la, tapi kalau stay ngan orang luar tak ke rasa segan. Fiza, sbnrnya ada je cara nak tutup kasi privacy sikit. Hehe. 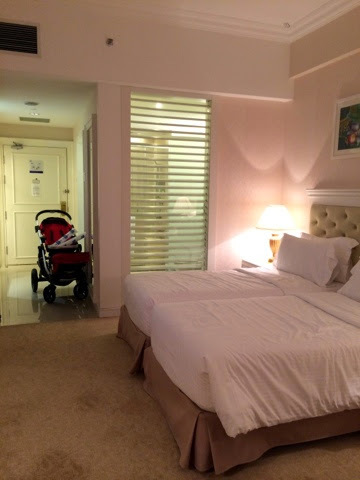 Nanti aku buat review satu lagi hotel ni, lagi open concept! 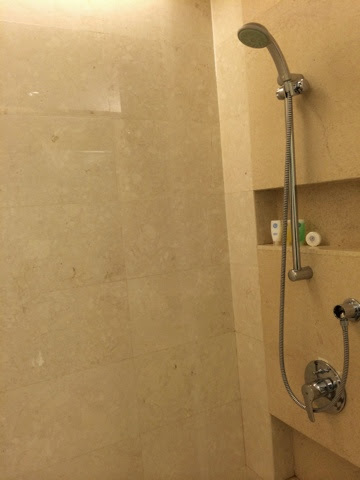 Tapi ada curtain boleh tutup sbnrnya klu kita tak nak anak2 kita ngintai kita mandi. Hehe. Husband tak pe la.